The book aspires to provide an essential guide for writing correct and effective business letters and emails. 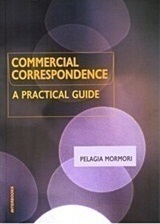 It can be a useful tool both for professionals whose success depends on effective communication and business writing and students of Business Administration, Economics and Management who can gain useful insights and information that will enable them to write clear and concise letters for every situation they may encounter in the workplace. The selection of sample letters provided can be adapted for an individual's or company's own use so that every time needed a letter/email can be produced effectively and with minimum effort. Γράψε μια αξιολόγηση για το Commercial Correspondence και βοήθησε σημαντικά τους άλλους χρήστες!